Tim Wallace's short-season Boise Hawks were bearing down on rival Spokane in August 1989. All the club had to do was win the next two to overtake Spokane in the standings, according to The Spokane Chronicle. "We feel we're tough at home," the Boise shortstop Wallace told The Chronicle. "The only thing on our minds is, we've got to win two. No ifs, ands or buts about it." Wallace was in the middle of one of his best seasons statistically that year with Boise. He hit .316 over 75 games. He went on to play a total of 12 seasons as a pro. He never got a chance to help win a game higher than AA. 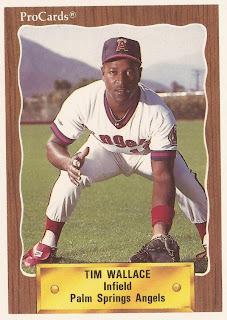 Wallace's career began in 1985, taken by the Cubs in the 32nd round of the draft out of Cal State East Bay. Wallace started with the Cubs at short-season Geneva. He appeared in 76 games and hit .226. He hit three home runs. He moved to single-A Peoria for 1986 and first made AA Pittsfield in 1988. He got into 22 games at Pittsfield, hitting just .114. That was his final season in the Cubs organization. Wallace played 1989 at unaffiliated short-season Boise. He tried to score on a home-plate collision in a June game. The catcher held on. He played 1990 between high-A Palm Springs with the Angels and AA Wichita with the Padres. He hit .288 overall. Wallace's 1991 campaign saw him in the Padres and Brewers systems, as well as at unaffiliated Reno. It was his final season with time in affiliated ball. He returned to the field for 1993 at independent Duluth-Superior He played 33 games there and hit .211. After not being credited as playing in 1994, Wallace played 1995 at independent Tri-City. He stayed in the Western League for 1997, playing at Sonoma County and hitting .286. His final professional season came in 1998 at independent Catskill. He played in 58 games, hitting .224, ending his career.